THE LONGSTANDING FAULT LINE in American life between politics and science has become increasingly unstable of late, drawing headlines on divisive issues ranging from stem cell research to evolution. But there's a subterranean aspect of this conflict that rarely makes the news: the fight over how science is used by government to protect us from health and environmental risks--in short, to regulate. Some time early next year, a federal appeals court in Virginia is expected to decide a pivotal lawsuit concerning the uses of scientific information in the regulatory arena. Brought by the US Chamber of Commerce and the Salt Institute, an industry trade association, the suit challenges a National Institutes of Health study showing that reduced salt intake lowers blood pressure. But there's far more at stake here than government dietary advice or salt industry profits. At a time when science itself has increasingly become the battleground of choice for determining what regulatory actions the government will take, the case turns on whether such fights will ultimately find their resolution in the courtroom, at the hands of non-expert judges. In the process, the suit will define the scope of the five-year-old Data Quality Act, a below-the-radar legislative device that defenders of industry have increasingly relied upon to attack all range of scientific studies whose results or implications they disagree with, from government global warming reports to cancer research using animal subjects. On its face, the act merely seeks to ensure the ''quality, objectivity, utility, and integrity" of government information. In practice, as interpreted by the Bush administration, it creates an unprecedented and cumbersome process that saddles agencies with a new workload while empowering businesses to challenge not just government regulations--something they could do anyway--but scientific information that could potentially lead to regulation somewhere down the road. The Data Quality Act, Chamber of Commerce vice president William Kovacs explained in an interview, allows industry to influence the regulatory process from ''the very beginning." Whether companies can sue agencies that reject their ''data quality" complaints, thereby dragging individual studies into the courtroom, is the legal question at the core of the Salt Institute and Chamber of Commerce lawsuit. If the judge in the case writes a precedent-setting opinion, and if higher courts agree, a brand-new body of law could emerge, consisting largely of corporate lawsuits against scientific analyses. But even if the lawsuit fails to establish judicial review of government regulatory science, Republicans in Congress (who are watching the case) are considering legislation that would ensure it anyway. And lawsuits are just the beginning. The Bush administration has also used the Data Quality Act's language as an excuse for implementing a government-wide, industry-friendly ''peer review" system for scientific information--one that scientific societies, including the American Public Health Association and the Association of American Medical Colleges, regarded with serious misgivings when it was first proposed. In the three decades since the regulatory revolution that created the Environmental Protection Agency and other fixtures of the federal bureaucracy, industry has become increasingly adept both at weighing down the rulemaking process with years of preliminaries and at challenging regulations once they are announced. Now, each regulatory decision seems to devolve into a ''science" fight--not because we don't have enough qualified scientists in federal agencies, or because they're doing a poor job, but rather because those seeking to avoid regulation constantly seek to raise the burden of proof required for action. The Data Quality Act provides an ideal means of achieving this goal--all under the guise of an attempt to improve the quality of information. In truth, calling the ''Data Quality Act" an ''act" smacks of over-glorification. In 2000, a flamboyant industry lobbyist named Jim Tozzi, who had worked for tobacco and chemical companies, and other interests, helped to draft two sentences of legalese that Representative Jo Ann Emerson, Republican of Missouri, then tucked into a massive appropriations bill signed into law late in the Clinton administration. But to understand where the Data Quality Act comes from, and how it facilitates a veritable war on government science conducted by private industry, you first need some historical context. Over the past several decades, companies subject to government regulation have increasingly sought procedural tools to allow them to challenge and dispute the scientific data forming the basis for such regulation. The overarching strategy--sometimes dubbed ''paralysis by analysis"--has been to make the fight turn on the validity of information, rather than moral or policy questions, such as how much of a precautionary approach our government should take in endeavoring to protect us from risks. One key proponent of challenges to government scientific information was the tobacco industry. In 1998, in a dress rehearsal for the Data Quality Act, lobbyist Tozzi worked on the so-called Shelby Amendment--named after its official ''author," Republican senator Richard Shelby of Alabama--for Philip Morris. Also a brief insert to an appropriations bill, and equally loathed by the scientific community, the one-sentence amendment allows for the use of the Freedom of Information Act to obtain ''all data produced" by any publicly funded scientific study. Though subsequently limited in scope by a wary Clinton administration, the Shelby Amendment helps companies conduct their own audits of studies they don't like--as many firms, including tobacco, have often sought to do. In the process, they can reanalyze the data and put a different spin on it. The Data Quality Act has been called the ''daughter" of Shelby. Sure enough, Philip Morris documents show that Tozzi circulated language for a ''data quality" regulation to the company and received comments in response. While Tozzi agrees there was ''definitely" a connection between the tobacco industry and the Data Quality Act, in an interview he insisted it was ''not a cause and effect." But he added that if tobacco companies had ''continued challenging stuff, data quality would have been a big help to them." With the Data Quality Act, industry had finally found a means of disputing agency science in the earliest stages of the regulatory process. At the merest public mention that a government agency might be looking at a particular study and wondering if it could compel regulatory action, industry interests could file a complaint challenging the agency's ''dissemination" of the information. ''Industry tends to think there's some magic bullet somewhere that's going to protect them from regulation," says Gary Bass, executive director of OMB Watch, a government watchdog group that has monitored the Data Quality Act closely, and a kind of counterpart to Tozzi on the left. ''If they can just get there earlier." Now, Bass continues, the strategy is to look ''in the science, in the data," for a way of avoiding regulation. In fact, both the Shelby Amendment and the Data Quality Act represent successful under-the-radar attempts to pass bite-sized pieces of legislation highly reminiscent of a massive, but failed, ''regulatory reform" bill pushed by Republicans during the Gingrich Congress in the mid-1990s. ''In the end," the Chamber of Commerce's Kovacs says, ''what we're going to get is far more than we could have ever gotten by having a comprehensive regulatory law passed." As soon as the Data Quality Act came into effect in October 2002, corporate interests took it for a test drive. Tozzi's Center for Regulatory Effectiveness teamed up with the Kansas Corn Grower's Association and a group called the Triazine Network to challenge an EPA risk assessment that had discussed evidence suggesting that atrazine, a herbicide in widespread use in US cornfields and on other crops, causes gonadal abnormalities in male frogs (possibly contributing to declining amphibian populations worldwide). Sure enough, citing the lack of an accepted test for measuring endocrine effects, the EPA ultimately concluded that hormone disruption did not constitute a good reason to restrict atrazine's use. Tozzi's petition very likely had an effect on the decision. ''You put the sequence together and I think it's common sense to say it had an influence," notes Sean Moulton of OMB Watch. And the atrazine challenge is just one example. The Data Quality Act has been employed in a wide variety of lesser known industry-friendly campaigns: by a chemical company challenging EPA information on barium, its product; by a law firm that has reportedly represented companies involved in asbestos lawsuits, objecting to an EPA document on asbestos risks from work on vehicle brakes; and by paint manufacturers questioning the basis for regulations on air emissions from their products, to name just a few examples. All three of these challenges targeted the Environmental Protection Agency. But other agencies have also seen an influx of complaints. Logging interests, for instance, challenged several US Forest Service studies and documents relating to habitat protections for the Northern Goshawk, submitting a massive 281-page petition outlining their objections. Some liberals and environmental groups have also attempted to employ the Data Quality Act. The libertarian-leaning Tozzi--a jazz aficionado with regulatory ''nerd" expertise --has himself teamed up with Americans for Free Access, which used the act to dispute government claims that marijuana has no medical uses. ''My musician friends will finally appreciate my work," cracked Tozzi in an e-mail alerting me to the pot petition. But mid-2004 analyses by The Washington Post and OMB Watch showed that the act, in effect for almost two years, had been overwhelmingly used by industry groups. In any all-out war over regulatory science, corporations will ultimately have the financial edge. In effect, then, the Data Quality Act tilts the regulatory playing field still further in industry's favor. But as successful as Tozzi's and his clients' efforts have been, they might not have gone very far without the help of John Graham. The controversial head of the OMB Office of Information and Regulatory Affairs (and former head of the Harvard Center for Risk Analysis), Graham is responsible for the review of government regulations in the Bush White House. Not long after coming into office, Graham seized upon the Data Quality Act and instructed federal agencies to draw up their own guidelines for implementing it by October 2002, when the law would go into effect. 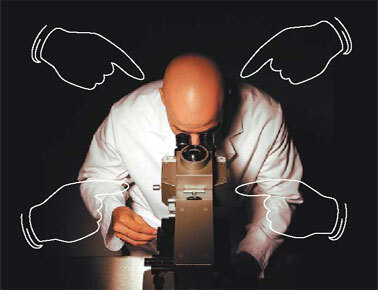 Then, in September 2003, claiming the Data Quality Act gave his office a newfound role in improving the quality of government science, Graham proposed using the act's thin language to justify an unprecedented government-wide ''peer review" system for agency science. As legal scholar Wendy Wagner of the University of Texas argued in a recent article entitled ''The 'Bad Science' Fiction," there's little real evidence to support the notion that government agencies churn out ''junk science"--a frequent industry accusation--or that their existing peer review protocols are inadequate. So it's no surprise that scientific heavyweights like the American Public Health Association and American Association for the Advancement of Science announced their concerns over Graham's initial proposal, which would have required review of all ''significant regulatory information," and an additionally laborious review process for data with ''a possible impact of more than $100 million in any year." Most significantly, perhaps, the proposal would have blocked academic scientists from serving as reviewers if they had obtained or were seeking ''substantial" research funding from the government agency in question--a condition likely to exclude leading academic experts in a field--yet showed little concern about the participation of industry scientists. Graham's office subsequently softened the proposal, and removed this most objectionable of requirements. But the administration has still failed to adequately explain why such a ''peer review" system was needed in the first place. After all, no government-wide standard for peer review existed in the past--and that may have been a good thing. Different agencies have different needs, just as different scientific disciplines employ different methodologies and standards of proof. Furthermore, concern about onerous and unnecessary intrusions into the regulatory process remain warranted. The process for vetting ''highly influential scientific assessments" under the new peer review plan remains quite burdensome, requiring the preparation of a peer review report that must be made public and a written response from the agency. Such procedures will only further ossify an already sluggish regulatory process. And as ''peer review" critic Sidney A. Shapiro, of the Wake Forest University School of Law, has observed, these procedures are required even for ''routine information" that is not ''complex, controversial, or novel." Such objections notwithstanding, in December of last year Graham's office finalized the peer review plan. Its provisions for ''highly influential scientific assessments" took effect on June 16. The media hardly noticed. Below the radar, as always, expansion of the Data Quality Act continues apace. Chris Mooney is Washington correspondent for Seed magazine and author of the forthcoming book ''The Republican War on Science" (Basic), from which this article is adapted.